Welcome to The Great Land! In addition to talks and presentations, our time in Anchorage promises to be filled with fun and good times! Here is an overview of our planned Social Events- more information on each specific event will be coming soon! 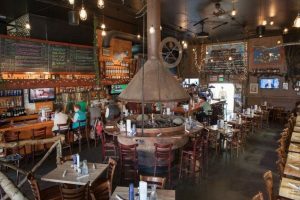 Welcome Social – Our welcome social will be held Monday evening May 21st 2018 at the 49th State Brewing Company https://www.49statebrewing.com/anchorage/ located just a few blocks from the Egan Center and Hilton in downtown Anchorage. Come and enjoy visiting with your colleagues over small-batch handcrafted brews and a menu filled with freshly sourced Alaskan products. See you there! Trade Show and Poster Social– This social will highlight our industry, non-profit, and artisan vendors as well as professional posters submitted as part of the program. Poster authors will be on hand to answer questions about their research over beverages and appetizers. Student Social (Invitation only) – Western Division AFS Student-Mentor Fish Trivia Challenge 2018! Come and test your knowledge of fundamental (and obscure, it IS trivia!) fisheries concepts through a trivia challenge between groups of students and professional mentors! This was a huge success at the Missoula Western Division Meeting in 2017. The event will be held at the Port View Banquet Hall (https://www.alaskaexperiencetheatre.com/) in downtown Anchorage, just block from the meeting venue at the Egan Center. Don’t miss this opportunity to dazzle the room with your knowledge, meet and network with professionals, and sample some of Alaska’s finest beverages and snacks.